With an ongoing look at fitness gadgets and tech, we're pretty pooped. Fortunately we were sent a few samples from Gourmosa, makers of healthy and energy-packed Indian meals. 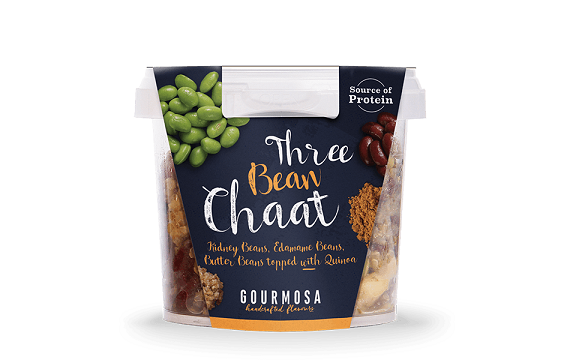 Great for those looking for a protein boost at lunch, we check out the Gourmosa Chaat Pots. As you might have guessed, these are small snack or light-lunch pots of Indian chaat, coming as either Three-Bean Chaat or Chana Chaat. Both are designed to be eaten chilled, so just like a pasta you can keep it in the fridge at work and pull it out when you're peckish, or in a gym bag for a protein-laden snack after a workout. 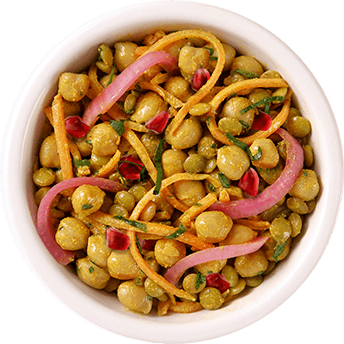 The Chana Chaat contains 17.9g of protein per pot while only being a total of 396 calories. There are also healthy fats and carbohydrates in there, as well as all the spicy flavour that you might expect from Indian cuisine. In fact, of the two, the Chana is by far the spiciest, although nothing that will knock your socks off – after all, if eaten after exercise, you might not to sweat even more! The Three-Bean Chaat was our favourite by far, mixing kidney, edamame, and butter beans with quinoa and a bunch of spices and seasoning. Is is drier to the taste that the Chana, but we all preferred that, and it was less sloppy to shove down our mouths at speed. There is 20.6g of protein in this one, with the same amount of calories to boot. Both are quick and easy snack pots that we've enjoyed after working out, and as a delicious snack whenever. Gourmosa do other modern and convenient twists on classic Indian dishes, so check them out.